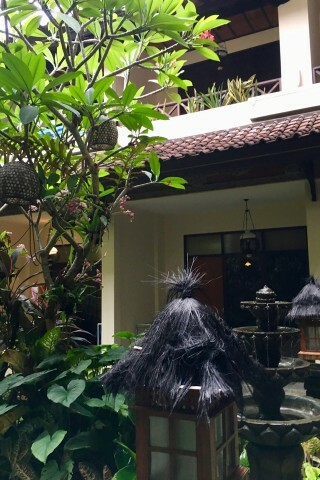 Ari Purti Hotel is an older-style classic midrange hotel with many traditional Balinese architectural features. Average rating 7.9 from 535 reviews. The mix of very well-maintained rooms at this family-run joint draws a bit of the Euro package tour crowd, as it’s excellent value. Set back a little from the main road at the southern end of Sanur, the grand entrance is resplendent with Balinese baroque. The sumptuous carved stonework continues as a feature throughout the hotel, underlining the fact that you’re in Bali. The mid-sized hotel offers more than 50 rooms in four categories in a sprawling two- and sometimes three-storey building that seems to branch off in odd directions, as well as two swimming pools, a bar, a spa and a popular streetfront restaurant, all infused with tropical lushness. The rooms may not be to everyone’s taste, and some may be a little dated, but they are spotless, comfortable and well appointed. A few rooms feature traditional artwork and classic furnishings, while others like the deluxe rooms offer a bit of modern glitz. Standard facilities include air-con, satellite TV, fridge and free WiFi. Ensuite hot-water marble bathrooms are luxurious with tubs and copious bench space. All rooms have a pleasant outlook to the garden or pools, and some with furnished balconies from which to enjoy it. Pools offer lounges, beanbags and shaded seating and the larger main pool provides a shallow section for the kids. The poolside cafe amd bar serves coffee, cakes and drinks in a pleasant open space decorated with traditional patterned tiles. Buffet-style breakfast is included in the rate. Reception staff are charming and super friendly and seem full of local knowledge. As a young single backpacker, you may feel out of place here, but the good value rooms and excellent location, minutes’ from the beach, make it a solid choice without the big spend of a beachfront resort for someone looking for a bit of midrange comfort or families. Another older-style, yet well maintained Sanur hotel worth considering is Puri Sading Hotel, further north along Jalan Danau Tamblingan. Check rates at Ari Purti Hotel on Booking.com. Room: Standard double room, low season: US$34, high season US$37. Notes: Peak: $40. Room: Superior double room, low season: US$38, high season US$40. Notes: Peak: $50. Room: Deluxe double room, low season: US$60, high season US$65. Notes: Peak: $70. Room: Suite, low season: US$100, high season US$110. Notes: Peak: $120.